In about one week, SueBeth and I will be presenting at the Ohio Kindergarten SDE conference in Columbus. We both like to be organized, so we have been crossing things off of the to do list the last month. One of the items that we had on our list was to have some business cards available for teachers who want to stay in contact with our blog. 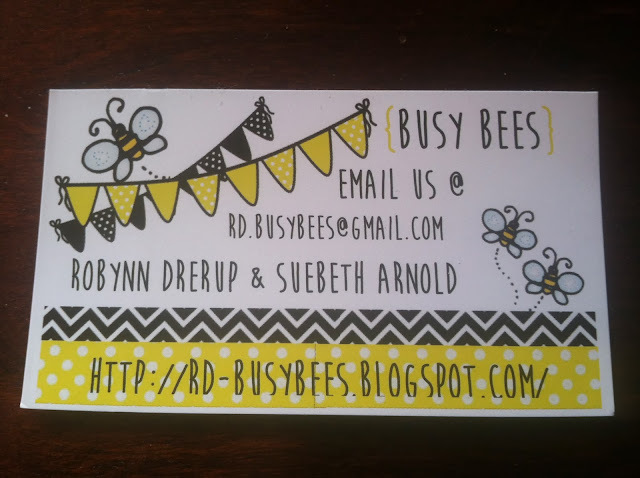 We went with the Busy Bee theme on our cards. SueBeth has not even seen them yet, so I bet she will be pleasantly surprised that this item has arrived and is off of the to do list. We met this week to take pictures and place our presentation on powerpoint. We also made some additional copies of things that we will be offering at our session. Getting so excited about this next presentation for us. We don't go back to school until Monday, so my next item is to make sub plans for being out 2 days the following week. Today was suppose to be the day I went into school with a friend for 2 hours to wrap up things for next week. We got a lot of snow today so we are on a level 1 which means going to school probably needed to be taken off of my to do list for today. Since I had a "free" day, I started working on a valentine's day project. It will be completed by January 13. Watch for this fun project real soon!! Welcome to Clean Business Card . Clean Business Card is a simple and eye-catching Professional Business Card.This business card is ready to print! It can express your social and personal status! >>>Fully Layered PSD files. >>>Fully Customizable and Editable with a click. >>>CMYK Setting. >>>300 DPI High Resolution. >>>3.5” x 2”(3.75” x 2.25” with bleed setting). >>>Print Ready Format.